Newly hatched forest tent caterpillars with the egg mass they emerged from. Egg masses are laid in mid-summer and remain on the tree through the winter. 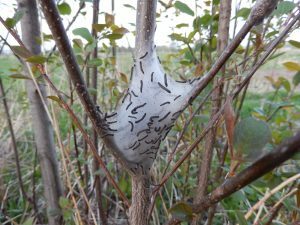 Low numbers of forest tent caterpillar egg masses were found recently during surveys in Vilas and Oneida Counties. Forest tent caterpillar is a native insect that has periodic outbreaks. Our last outbreak was from 1999-2002, and they typically have outbreaks every 10-15 years. Last year I noticed a few more caterpillars than the previous year, but there was no noticeable defoliation. So far egg mass surveys indicate another year of low populations, although there may be areas with locally higher populations. Forest tent caterpillar eggs will start hatching soon, timed to closely match the emergence of aspen leaves. Eastern tent caterpillars hatch from eggs and immediately start to create a web nest. Young caterpillars are shown on a small nest. Eastern tent caterpillars do not follow a typical outbreak pattern and tend to be present at some low level every year. They create web nests early in the spring, preferring black cherry trees, crabapple trees, or other stone fruits. When webs are small the caterpillars can be easily crushed or sprayed. As webs get bigger you may have to use a rake to pull them out of the tree. It is not necessary to prune the branch out of the tree. 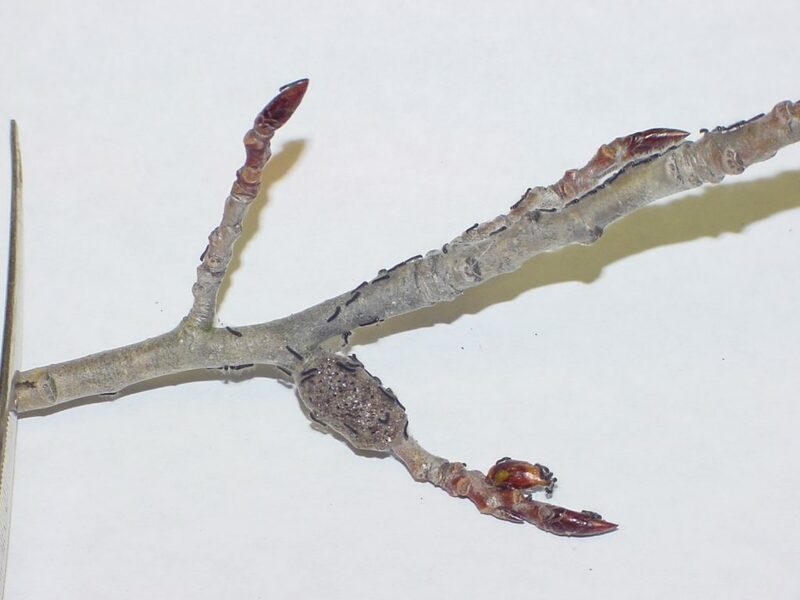 Doing so will actually cause more damage to the tree than the defoliation caused by the caterpillars, because trees can more easily send out additional leaves than grow a branch to replace one you prune out. Please do not burn nests out of the trees as this could start a wildfire.